Doug Lemov has fast become a leading name in educational practice. 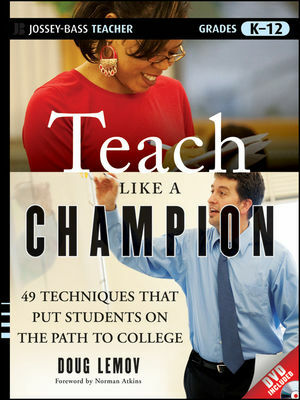 His instant classic ‘Teach Like a champion’ provides teachers and school leaders with over 40 simple, yet highly effective strategies that can be incorporated into any classroom, in any school. With a background teaching and leading in high poverty schools in the US, Lemov has become a guru of instructional leadership and classroom practice. The book categorizes the techniques for readers, providing an easy to navigate structure. Generally speaking, Lemov presents a range of strategies that emphasize teacher clarity and purpose, accuracy, classroom routines and skill development. Some of my colleagues recently criticized some of the strategies contained in the book, deeming them to be overbearing and teacher centric. They also suggest that many of the strategies may be a bit “too American” and may not be translatable into every cultural context e.g. Australia. Perhaps they have a case however, as it would be virtually impossible for any reader to employ every single strategy in the book on a regular basis, the discerning reader will choose the techniques that best suit their needs. Perhaps this is the real strength of Lemov’s book, which is for leaders and leadership teams looking to identify classroom strategies to build school improvement around. The book allows leaders to then implement the strategies with their whole staff, aided by the not only the well written descriptions and diagrams, but the attached classroom observation videos as well. Some may baulk at the prescriptive nature of the strategies presented in this book, but as a resource to sharpen teacher skills, reinforce teacher clarity, and to build classroom based school improvement, this is an outstanding resource.